Rowing is a family tradition for Maddie Wanamaker, whose parents both competed at the UW. 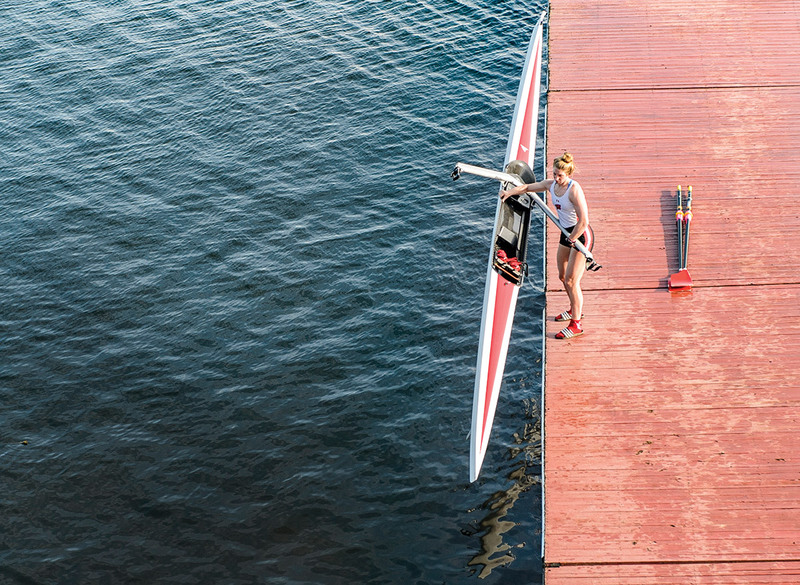 Last fall, just before the docks outside the Porter Boathouse were removed from Lake Mendota for the winter, Maddie Wanamaker ’17 took one final row. The water was as still as glass, and the sun was setting as she moved her single scull past Memorial Union toward University Bay. The UW Marching Band was practicing, and “On, Wisconsin!” drifted over the lake. As she reflected on what rowing meant to her, she began to cry — as she did when she recounted the moment — and then she laughed at what she’d been thinking. The previous summer brought a disappointing finish for the rower from Neenah, Wisconsin. She’d spent weeks undergoing intense training with the U.S. 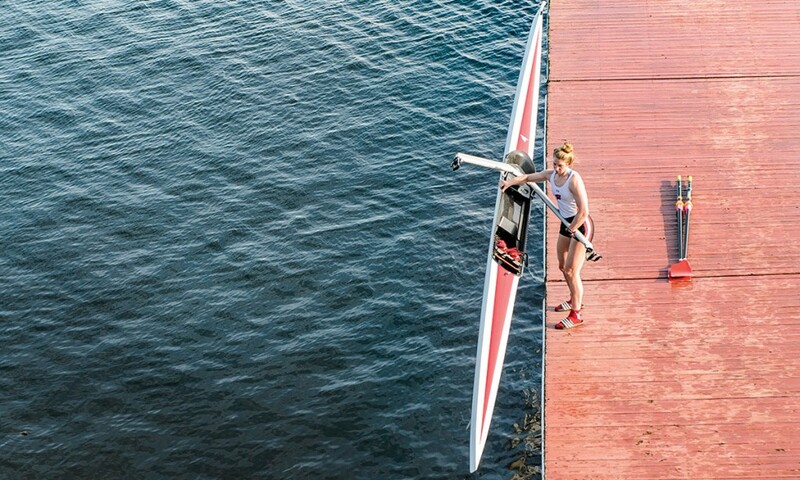 Under 23 national team, but at the world championships in the Netherlands, her boat placed 11th in quadruple sculls. “I can’t row anymore. I can’t keep getting better. I’m just going to be stuck,” she told herself upon returning to campus for the start of the fall semester. Wanamaker — the daughter of two former UW rowers — let go of the idea of competing after college. She planned to finish out her career with the Badger women’s team, complete her degree in environmental studies and life sciences communication, and transition to coaching during a fellowship program in Boston. Growing up in the Long Island town of Point Lookout, New York, Leonard Manning x’14 always felt comfortable being surrounded by water. So when his older brother convinced him to try out for his high school rowing team as a coxswain, Manning was hooked. In his junior year, he earned Most Valuable Player honors, and he coxswained the boat that won the New York State Rowing Championship in 2010. 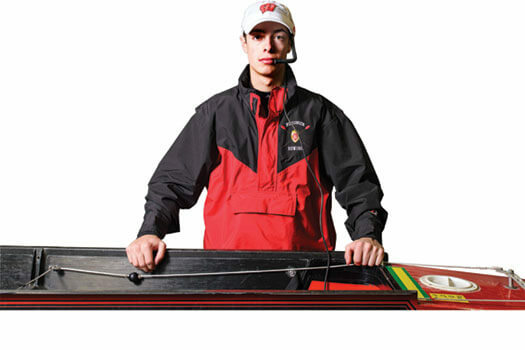 Then following in the footsteps of two others from his high school, Manning chose to attend UW-Madison, where rowing is the oldest sport on campus — originating in 1874 — and boasts nine national championships. Manning is part of the UW’s varsity eight crew (regarded as the most prestigious and fastest boat), but as a coxswain, he never grabs an oar. Instead, it’s his job to push his teammates’ bodies to their limits and navigate the boat. To do that, he needs his team to trust that he’s putting them in the best position to win. “Some coxswains try to motivate a boat,” Manning says. “I try to motivate each guy individually.” He does that in part by having conversations with the crew throughout a race. And even though the sport of rowing should appear graceful to the average spectator along the shore, it’s a different story inside the boat. [In regard to] the Wisconsin governor complaining about the crew coach’s harsh language [Traditions, Spring 2013]: During finals week 1969 at Liz Waters, we would drag our mattresses to the lakefront back patio to sleep. All was tranquil until dawn, when the crew skimmed by, and the coach from his motorboat kept screaming his head off — and he didn’t limit it to “harsh” language, believe me! I got the inspiration to tape a note to the boathouse door, not so much complaining about the noise, but asking if the coach was having marital troubles or something and taking it out on his team. Emboldened by that, we left a note again that night — a request that they sing “Varsity” to us. And they did. My favorite Badger moment ever. Sonya Baumstein takes a turn at the oars in the Limited Intelligence during her row across the Atlantic. The craft was decorated with inspirational quotes such as a line by the French writer André Gide: “In order to discover new lands, one must be willing to lose sight of the shore.” Courtesy of Sonya Baumstein. Sonya Baumstein’s rowing career didn’t end when she was hit by a car — it just became a lot less conventional. If everything goes according to plan, fourteen months from now Sonya Baumstein ’07 will be somewhere east of Tokyo, afloat on the Pacific Ocean, pulling with all her strength to row a tiny boat to safety in San Francisco and trying not to die. Now, things don’t always go according to plan with Sonya, but I’m confident she will be on that ocean, because she’s shown a knack for getting herself into and out of extreme situations. This will be the second ocean she’s rowed — she crossed the Atlantic in an open boat in the winter of 2011–12. Then she biked across the United States. Then she kayaked up the Inside Passage, from Seattle to Juneau. So the Pacific row, which she plans to do with just one person (British captain and author Lia Ditton) for company, is just another leg on her long, improbable journey. It was Sonya’s mother, Debra, who called and alerted me to Sonya’s first nautical adventure while she was still at sea. Sonya, Debra told me, was a former UW athlete and was taking part in the Talisker Whisky Challenge, a race from La Gomera in Spain’s Canary Islands to Port St. Charles in Barbados. Knowing that On Wisconsin ’s readers like learning about Badger athletes, I said I’d be happy to speak with Sonya. After I hung up, however, I wondered: why would someone do this? It certainly wasn’t to please her parents. So why suffer pain and risk death in pursuit of something so unnecessary? After all, if one wants to cross an ocean, there are easier, faster, and less dangerous ways, including standing on shore and hoping a cyclone will come along and blow you across. Maybe, I thought, Sonya does this because she is crazy. When I spoke with her, I floated that theory, and she objected — kind of. In another age — in the days when George Mallory was trying to scale Mount Everest, for instance, or Robert Scott was racing to the South Pole, or Amelia Earhart set out to fly around the globe — people would have treated Sonya as a hero, marking down her words for inspiration. But what were once great adventures are commonplace today. In the eighty-nine years since Mallory famously told the New York Times that he was trying to climb Everest because it is there (then went off and died during his attempt), more than three thousand people have successfully reached the world’s highest peak, some more than once. Cruise ships stop in Antarctica, and so many people have flown across so many oceans that no one keeps count. These days, it’s hard to find an adventure in death-defiance that retains novelty. Ocean-rowing could be that adventure, though more people have done it than you might think. The website oceanrowing.com documents 331 boats that have been rowed from one side of a sea to the other without the assistance of sails or machinery between 1896 and 2012. Some have been solo efforts; others have been veritable galleys with crews of a dozen. But most of those people spend years training for their effort. Sonya trained for the Talisker Whisky Atlantic Challenge for about ten months. Still, it was hardly her first time in a boat. She fell in love with rowing at a young age — with, that is, the normal, competitive rowing one sees on college campuses, the kind with sculls and shells and coxswains keeping time. That’s what made this Orlando, Florida, native a Badger. Sonya rowed in high school and, though she was recruited by Princeton, chose UW-Madison, where she enrolled in fall 2003. The women’s rowing team won national titles in Varsity 8 in 2004 and 2005 and in lightweight in 2004, 2005, and 2006. But Sonya wasn’t destined to be part of that success. On July 18, 2004, in the summer after her freshman year, Sonya was at home in Orlando. That night, she was out with two friends, and while walking across a six-lane road, a car bore down on the three of them. Sonya managed to push one friend out of the way, and the other took only a glancing blow. The car, traveling at forty-five miles an hour, hit Sonya square on. She bounced up over the hood, shattered the windshield, and then was thrown thirty feet. Still, fine is relative. Sonya had a collapsed lung and thirteen broken bones, including her skull, tibia, and fibula. Surgeons had to implant a rod in her leg and insert forty staples to hold her flesh together, plus eighty stitches in her head alone. So much shattered glass was embedded in Sonya’s arm that it took five years before it all came out. Her parents told her to take a year off and recover. Instead, Sonya returned to Madison in August. She studied art history. She worked out with the athletic department. The accident finished her collegiate rowing career, but not her competitive drive. So Sonya decided she would take part in an Ironman triathlon — a combination running, swimming, and biking race. She jogged every day. But whereas before her accident, a ten-mile run was easy, afterward it seemed impossible. The triathlon never materialized. After graduation, Sonya went to the University of Central Florida, where she earned a master’s degree in — and then taught — nonprofit and volunteer management. And she coached high school rowing. It was a fellow rowing coach who told her about the Talisker Whisky Challenge, and that opened Sonya’s eyes to what she wanted to do with her life: she would become a professional adventurer. She made plans for what she calls the 400 Challenge, attempting four extreme adventures (rowing the Atlantic, biking from the Mexican border to Seattle, paddling a kayak up the Northwest coast from Seattle to Alaska, and hiking the Pacific Crest Trail) within four hundred days. She formed a website to follow her quest, and called it Epoch Expeditions. 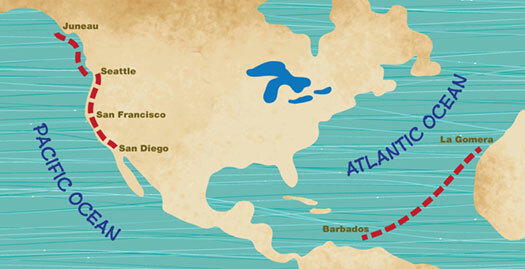 Sonya’s 400 Challenge began with a row across the Atlantic, from the Canary Islands to Barbados. She then flew to California, biked to Washington, and kayaked to Alaska. She intended to hike south through the Cascade Mountains but ran out of time. When she told me this, we were sitting in the Rathskeller. It was the end of September, and she was in town to visit a friend — all of her friends, she said, were getting engaged, married, pregnant. She, however, had just brought an end to the 400 Challenge, having successfully completed three parts — the row, the ride, and the paddle. She’d had to give up on the hike down the Pacific Crest Trail. Each stage had taken longer than expected, and the weather was no longer favorable for a five-month-long walk in the mountains. She told me how to train for a row across the ocean. Pushing calories is important when one is preparing to row approximately 2,550 nautical miles (or 4,700 kilometers, if you prefer), especially when one anticipates spending that time eating nothing but lightweight, easily stored foods: dried potatoes, stuffing, oatmeal, nuts, granola, and pudding. But there’s also practice. Sonya says she jogged, lifted weights, and swam, and spent two hours a day on an “erg,” a rowing machine, set to the highest resistance level to simulate the weight of the craft she’d use on her voyage. Two hours a day may sound like a lot. But what she was about to attempt was to spend twenty-four hours every day in a rowboat. While she wouldn’t be pulling at the oars continuously, she’d be on them half of each day, or six times what she was practicing. She told me how difficult it was to line up sponsors to defray the cost of the adventures, and how she’d had to sink the money from her accident settlement into the plan, using it to buy a used ocean-going rowboat — a thousand-pound, twenty-seven-foot-long vessel with two tiny cabins. Its previous owners, members of the British military, had called it the Limited Intelligence , a name Sonya felt was fitting and kept. She told me how she’d gone online and recruited near strangers for her crewmates: Oliver Levick and twin brothers Chris and Jonathan Crane. In total, it was fifty-six days, nine hours, and twenty minutes that they spent at sea — time that the little crew had divided into 682 two-hour shifts, Sonya and Levick rowing while the Crane brothers slept and vice versa. She told me about navigation in forty-foot waves and in calm seas; about seeing only six other vessels, none closer than five miles; about the sharks and whales that came within fifteen feet of the boat; and about the death of batteries and hand-pumping a desalinator for an hour each day just to make two liters of drinkable water. And she confessed that the foursome didn’t wear life jackets, or much else — continually sprayed by waves, clothing collected salt as the water evaporated. Because of the endless, repetitive rowing motion, their clothes scraped them raw, and then literally rubbed salt in their wounds. She told me about the tendinitis she suffered after the trip, so severe she couldn’t stand for a week without pain, or open her hands for a month. Afterward, Levick and the Crane brothers decided they’d had enough, but Sonya carried on. She found new companions and then lost them: she biked with Florida friends, paddled with a man from Omaha who’d never been in a kayak, and then replaced him with a man she met along Canada’s Pacific coast. Ultimately, she finished alone. She told me about having bikes stolen in San Francisco and waiting a month for replacements. She told me how the cyclists she’d met called her — with a mix of respect and derision — a “NoBo,” meaning a north-bounder. The prevailing winds along the coast blow north to south at an average of twenty miles per hour, making a NoBo’s ride extra difficult. She told me of the people she met along the coast when she started paddling — “I don’t think there’s a single bad person who’s a boater,” she says. But it wasn’t just people she met: she heard bears at night while she was kayaking through the islands of British Columbia, and one morning while she was camping alone, she was awakened by a pod of whales passing by. All the while she was driven by a satisfaction found in experiencing intensity, in driving her body and mind beyond their limits. The last time I spoke with Sonya, she was in the mountains of Washington State taking wilderness EMT training — pretending to rescue people who were pretending to be hurt. She believes it will help with her next enterprise, Epoch Expeditions. She’s turning her desire for adventure into a nonprofit business helping others experience their own extreme challenges or just teaching them how to camp. She’d already set up ten short treks for 2013 — hikes, bike rides, kayak paddles, and even a two-week extreme row across the Gulf of Mexico. Her EMT training, naturally, would give her the skills to handle a medical emergency, should one come up. And it would prepare her for an illness or injury that might occur on her Pacific row, which may take six months to complete, triple the time she spent on the Atlantic. Prepare within limits, anyway — she’d still be miles at sea, far from doctors and hospitals and help of any kind. But the prospect of mortal danger doesn’t deter Sonya, who aims to be the first American to row the Pacific (and depending on whether she or Ditton sits in the front of the boat, the first woman). John Allen, senior editor of On Wisconsin, keeps his limited intelligence on shore.